Spin to win 50,000 Feroshi Coins and see how high you can climb in this free-to-play action game. Shawnimals' Ninjatown: Trees of Doom released so long ago (2010) on iOS that we forgot it existed, so it was a nice surprise to learn that this charming and addictive title has finally appeared on Android. Even better, it's free. 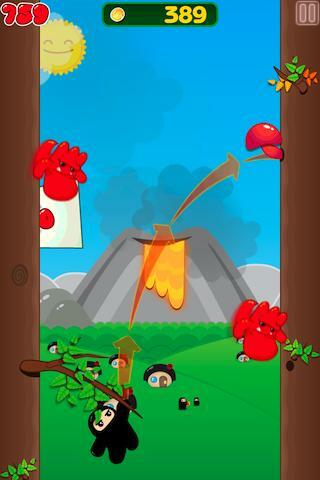 If you never experienced the game, you control the Wee Ninja as the little guy attempts to climb a humongous tree while dodging all manner of obstacles, from pajama-wearing rivals to volcanos. What's especially unique about the Android version is Facebook integration to share scores and Feroshi's Magic Scrolls, a spinning wheel that grants users a chance to win up to 50,000 Feroshi Coins, used to purchase new outfits and power-ups. We think quite highly of the iPhone version, and that said, definitely recommend checking the game out on Android. Read our Ninjatown: Trees of Doom review for more.